One of the fascinations of bus operations is the whole illogicality of it. Surely a small independent in the Swansea Valley couldn�t make a success out of a bus type the mighty Crosville had abandoned prematurely? In the real world of course not, but this is buses, abandon logic, and suspend disbelief someone loved the SEDDON RU. This is the story of the firm who swore by a bus everyone else swore at. East End Coaches, Clydach. The Seddon RU was one of a rash of low framed rear engine long single deckers developed in the 1960s to take advantage of construction and use regulations permitting one man operation of 36ft single deckers. It kept such in-illustrious company as the Leyland Panther, AEC Swift, Daimler Roadliner and the slightly less flawed Bristol RE. The basic concept of these vehicles had some weakness that later single deckers eradicated. Locating the engine at the rear of the bus suspended from the chassis frame caused weight imbalance and this was compounded by the predominance of dual door layouts on these vehicles. Centre doors split both the waist and cantrails and in many cases the weight of the engine caused the body frame to sag or even split around the doors. The RU � an attempt at an RE clone � compounded this by providing a short drive shaft at a steep angle which caused many failures. This coincided with its biggest order for 100 foist on a reluctant Crosville by the National Bus Company. All had to be modified by the manufacturer. 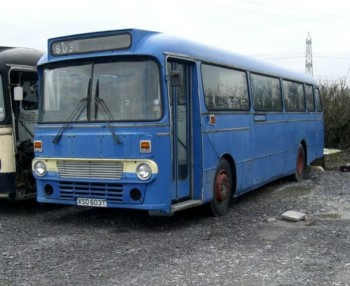 Fortunately later vehicles were built incorporating the modifications but new owners saw Seddon abandon bus building for a while, and the RU died in 1974 when the 274th and last bus was delivered to West Yorkshire PTE. Its only good point seemed to be the ever reliable Gardner engine. 150 went to two operators (Crosville and LUT), the rest mainly went to Lancashire and Yorkshire municipals, close to the Oldham factory. Accrington, Blackburn, Burnley, Doncaster Halifax, Huddersfield, Lytham, Morecambe and Rotherham all bought them as did Darlington and two Scottish independents � Dodds of Troon and Garelochhead plus Reliance of Sutton in North Yorkshire and oddly of all Southampton Corporation. Most had bodywork by Pennine Coachcraft � a subsidiary of Seddon. The bus industry was a curious place in the 1970s. Bus grant meant new vehicles were cheap, with the government paying 50%. The Certificate of Fitness scheme meant buses had a major overhaul after 7 years and then again after 13. One man operated double deckers were permitted and popular. As a result all but Darlington�s 8 were withdrawn by the first owner before their 13th birthday. Burnley & Pendle was one of the first to withdraw its RUs, with 9 going on their 7th birthday and the rest by the time they were 10. A few went to new homes and one of these was East End Coaches, based in Clydach just north of Swansea. East End�s bus operations were just one of a number of businesses owned by the Jones family in the town and dated from the 1950s. 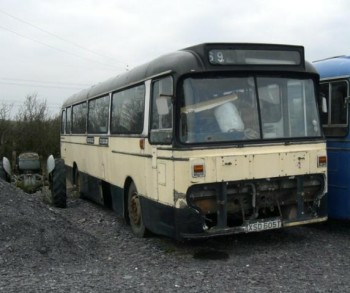 Its first Seddons were ex Burnley SHG123/30K which arrived in December 1980. Above - Former Lytham 47 (STJ847L). They were followed by RHG311/4/7K in November 1981 and RHG313K in January 1982 all from the same source. 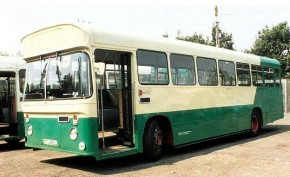 Fylde (Lytham�s successors) sold its Seddons in May 1982 with STJ845-7/50L joining the East End fleet which now totalled 10. Indeed for a while Fylde�s blue white and yellow livery was adopted fleet wide before the later green and cream scheme was adopted. 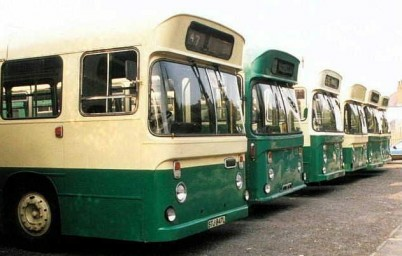 The Seddons were put to work on school services but a short lived local bus service into Swansea ran after deregulation. This idyllic semi retirement for the Seddon�s seemed to suit them � especially the Fylde ones which were quite low mileage vehicles anyway� Fylde�s coaches covered many bus duties in the winter to ensure they were eligible for bus grant. Meanwhile up in the North East, Darlington continued to enjoy its Seddons. Their fleet was somewhat eccentric, including single deck Daimler Fleetlines and Dennis Dominators and the Daimler Roadliner whose reputation made the RU seem popular by comparison. The end finally came in February 1991 and all eight were sold, six making the long journey to South Wales to join East End�s fleet. WHN462/3/5/8M were destined for further service, WHN466/7M as spares donors only. These replaced most of the ex Burnley examples, only RHG314K surviving. STJ845/6L also bit the dust, during the early 1990s. As a resident of Lytham St. Annes and now Blackpool, the history of Fylde�s operations has been close to my heart. Around 1997 I became involved with the Lancastrian Transport Trust which preserves Blackpool and the Fylde�s transport heritage. In August that year I had a holiday in South Wales and decided to check out East End�s operation. It was rarely covered in Buses and I confidently expected all the Seddons to have run their last journeys years before. Imagine my surprise to round a bend on Pontardawe Road to find a line up of RUs in a roadside yard. Alan Mason, the operations manager was there and kindly let me look over STJ847L � one of the two Fylde ones I hadn�t seen in 15 years. STJ850L was there plus five of the Darlington ones � only WHN465M had gone. They were all locked up for the school holidays. Alan showed me RHG314K stored in another yard, withdrawn. Alan kindly offered to let me know when they were finally withdrawn but suggested I reminded him periodically as he expected that day to be some way off. Sadly in the summer of 1999 a fire was started with destroyed the two spares donors WHN466/7M and operational WHN463M � this latter having the front end of an ex Crosville bus grafted on after heavy accident damage while in Darlington. Ex Fylde STJ850L was badly damaged which was fortunate as I had set my eye on sister 47. This signalled the beginning of the end for the RUs, as the last Darlington pair was stored later in the year and in February 2001 we heard STJ847L had been retired at the end of the previous year. Alan, true to its word, kept it intact and we duly bought it. A minor repair was needed and Alan supplied various spares before moving it to Merthyr Tydfil from where we later collected it. After sometime stored in the West Midlands it moved to our new restoration base in Blackpool in 2003 � 21 years after leaving for the Swansea Valley and one of only two survivors of 274 built. After a 28 years service life, albeit only in part time employment for much of it � the Seddon had truly come good � not bad for a design written off so early on. Sadly East End called time on its operations in 2002. The other Seddons had gone for scrap by summer 2001. 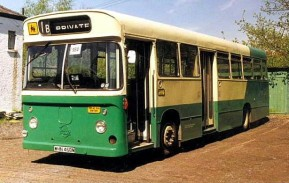 Although STJ847L is now back in the North West and will soon be restored as Fylde 47 in its 1980 livery, it still retains a Welsh connection as this was the livery East End adopted. We will also retain a somewhat unusual customisation from its Welsh life � the windscreen wiper control knob was replaced by a plastic hippo. Well I did say logic didn�t apply to buses. Another Welsh coach operator to put some faith in Seddons hasbeen Derfel Owens from the village of Rhiwlas perched high up on the mountain slopes above Bangor in North Wales. Owens has three Pennine VII with Alexander D49F duel purpose bodies, XSD602T,XSD603T and XSD605T which were new to Western SMT as 2793,2794 & 2796 and new in September 1978. Of the three only XSD602T is still in use, the others illustrated below are withdrawn.